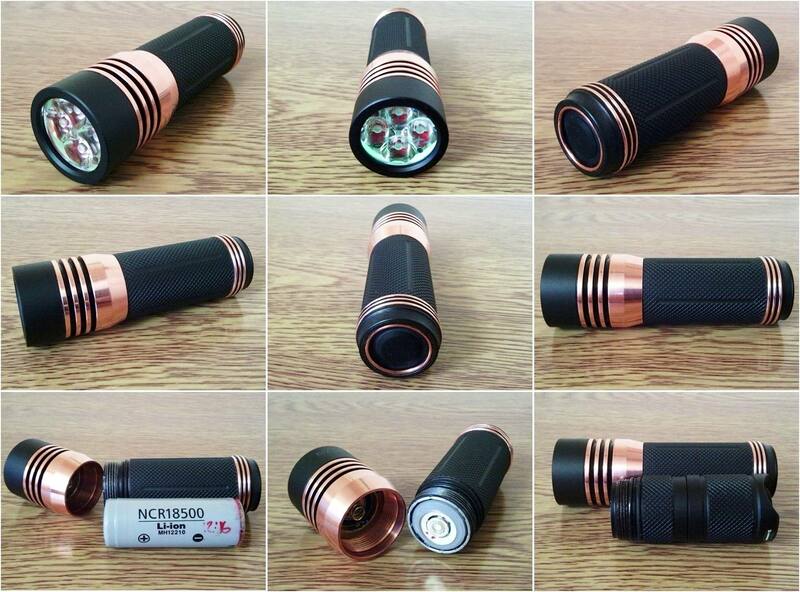 Manker E14 Quad XP-L HI V2 1A - FET 17 - 18350 - Fw Clicky Sw - 2500lm. Battery tube was too long at ends, leaving gaps, showing orings so I filed it down a little from 37mm to 36.5mm and blackened the copper head to see what it would look like. The head was glued, it was not strong stuff though, quite chewy. Wrapped up head & body well with G-tape and ran the light in turbo mode until very hot. Twisted off bezel, difficulty rating – 4. All XP-G2 emitters present and accounted for. 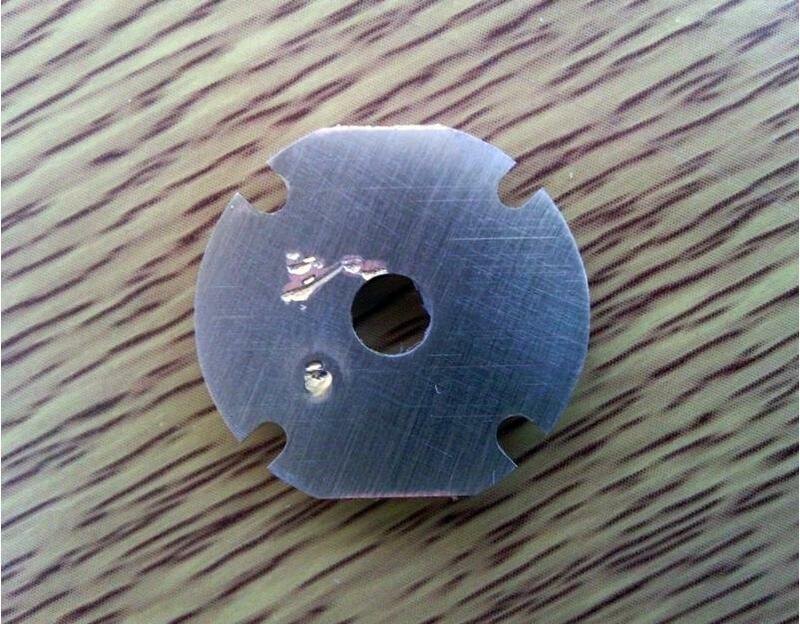 Plastic screw washers – washering, screws – not made from cheese. Soldering – not too bad. Thermal paste coverage – Fail, MCPCB – Fail. This damage obviously kept the board raised slightly on one side so I’ve lapped it flat but this is as good as this MCPCB will be. Raised bumps around screw taps & sharp edges around central wire hole on driver side countersunk fixed. Extra long 24 AWG silicone wires replaced with shorter thicker 20 AWG. Preliminary readings - 7.42A Max. Installed four XP-L HI v2 1A LED’s and changed polarity of the MCPCB. Eventually changed the driver to a 17mm MTN FET with GuppyDrv Rev1. 8.51A Max. 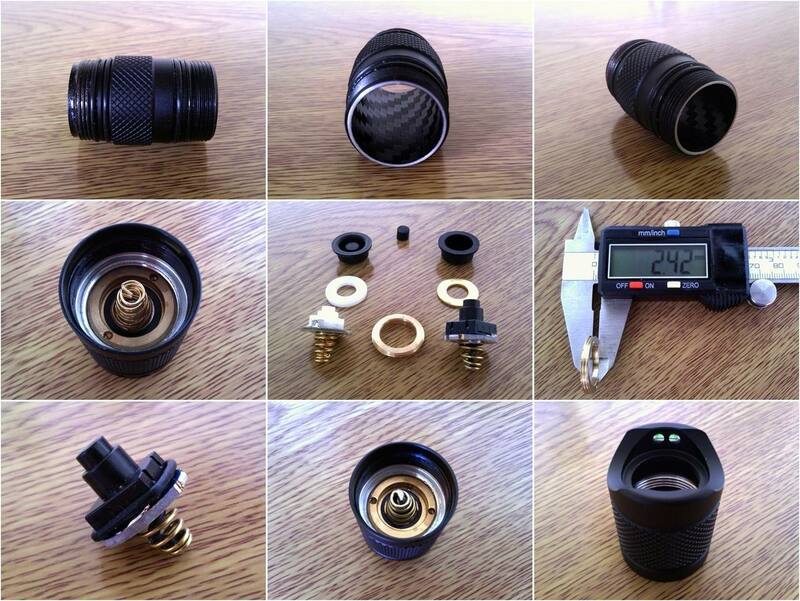 Measure inside diameter of tube, multiply by 3.14 and this will give the length you need for a nice tube insert. Reverse clicky changed to forward clicky with wire spring bypass, sanded down switch retaining ring from 3.1mm to 2.42mm and used a thinner brass washer. Very nice. I like your battery tube inner wrap. Your mod reminds me of mods gone by and rarely posted up today. Thanks for taking the time to post it up. I wonder how well the anodising would bake? How did you blacken the copper head? I use cold bluing solutions for darkening metals. No real stress, just a bit of spare time filled with minor tasks that make a nice little difference when completed. Anti rattle film? …I am curious yellow. Nice work. The black head looks cool but I kinda like the showy copper. Did you double up the rear spring by adding the front spring? I assume this is equivalent to a bypass. I was lucky; no glue on mine. Interesting! Can you provide a link to what you use? I can see a number of uses for this in my mods. Thread updated with new stuff about the head rebuilding and i think i’ve answered those who asked questions there. Wow CRX. the black in the heatsink slots looks great! Hmm.. after seeing the innards of yours I’m inclined to follow suit and do some tweaking. Nice looking head, too. Did you rub off the coating and will it patina now? Thanks for posting this very nice pictorial of the build and tweaks! Is this copper? ... Please, I need confirmation. It looks like we are looking at nickel. All Noctigons are very thin coated gold on the outside, nickel underneath to help the with the gold bonding, and then the solid copper under the nickel. Around the indentations, you can see all 3 layers. The gold can be removed practically waving super fine grit sandpaper over it, while the nickel takes a little bit of rubbing. I've sanded down many a Noctigons over the years. Is this copper? … Please, I need confirmation. The gold can be removed practically waving super fine grit sandpaper over it, while the nickel takes a little bit of rubbing. I’ve sanded down many a Noctigons over the years. 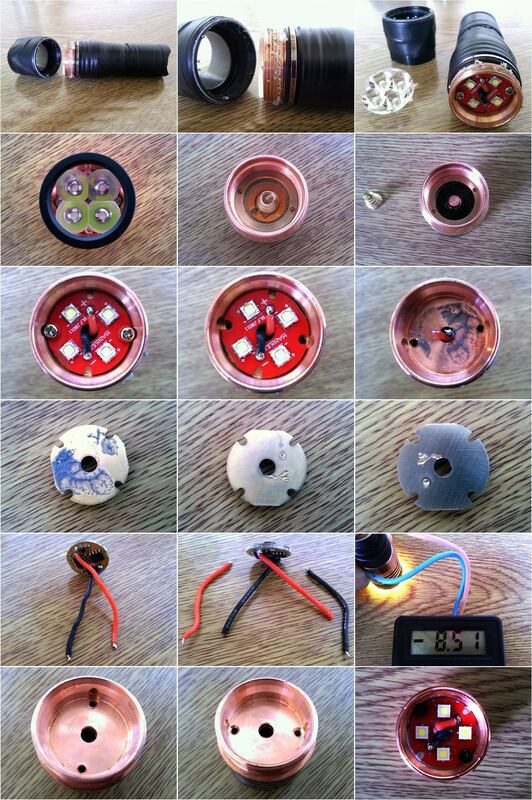 Q: is the bluing conductive, and can it be soldered to? Great thread crx! that looks stunning with the black stripes. Great job, it looks super. CRX, what battery are you using? It must be 16340 or cr123? I just took about .005” off of each end of the battery tube to square it up and improve contact. I don’t think I can go any shorter and still take a 18350. Also mine is a S41 but I doubt there’s any difference. Did you rub off the coating and will it patina now? That’s why i trimmed down the driver retaining ring and replaced the spring with a copper stud so as to leave plenty of space in the battery compartment. Nice work sorting out the details – that’s where the devil is, & something we’ll probably never see coming off a production line in a budget light. I’m thinking about changing mine to a forward clicky. Besides the switch, do i need any other parts? Just wanted to know before i tackle this. It’s a fairly simple swap, i think i just cut the nub off the rubber boot and used a slightly thinner washer.